When you upgrade a graphics card alone, you must take into account that new models may be incompatible with your motherboard, as there are not only several types of expansion slots, but also several versions of them (this applies to AGP, and it will soon affect PCI Express). If you are not sure what to do, read this section thoroughly. As we have already noted, a graphics card is installed into a special expansion slot on a motherboard. GPU uses this slot to exchange information with a PC processor. Motherboards usually have expansion slots of one or two (rarely three) different types. They differ in bandwidth, voltages, and other characteristics, and not all of them can accommodate graphics cards. It's very important to know what slots you have on your PC's motherboard and buy a graphics card accordingly. Different expansion slots are incompatible physically and logically. A graphics card designed for one slot type cannot be installed into a slot of another type. We shall not touch upon ISA and VESA Local Bus expansion slots and their graphics cards, because they are hopelessly outdated. Not all specialists know about them now, except for their names and the fact that they existed. We shall also skip PCI slots, as there are no graphics cards for them anymore. Modern graphics processors use either AGP or PCI Express interface. These interfaces mostly differ from each other in bandwidth, power options, as well as less important characteristics. Theoretically, the higher the interface bandwidth is, the better. But in practice, even a several fold difference in bandwidth does not affect performance much, and interface bandwidth rarely acts as a bottleneck. 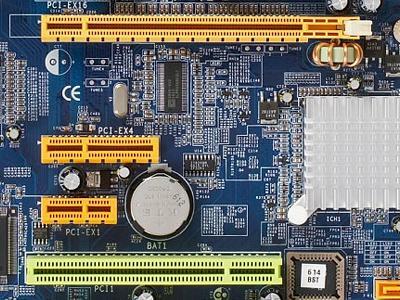 Only a few modern motherboards are not equipped with AGP or PCI Express slots. The only expansion slot available on them is PCI, but graphics cards for this slot are quite rare and cannot be used in a home computer. So let's review the two modern interfaces in more detail. You should look for these very slots on your motherboard. Look at the photos and compare. AGP (Accelerated Graphics Port or Advanced Graphics Port) is a high-speed interface, based on the PCI specifications, but designed to connect graphics cards with motherboards. AGP bus works better with graphics cards than PCI (not PCI Express! ), because it provides a direct link between a CPU and a graphics processor, as well as some other features that enhance performance in some cases. For example, GART (a capability of reading textures directly from memory without the need to copy them to video memory); higher frequency; simplified data transfer protocols; etc. Unlike the universal PCI bus, AGP is used for video cards only. The interface has several versions. The latest version is AGP 8x - 2.1 Gbps bandwidth, which is 8 times as high as the initial AGP standard (32-bit, 66 MHz). New motherboards are not equipped with AGP, because it was driven away from the market by PCI Express. But AGP is still widely available and provides sufficient bandwidth even for new graphics processors. AGP 1x - 32-bit channel operating at 66 MHz. Its bandwidth is 266 MB/s, which is twice a high as PCI's (133 MB/s, 33 MHz, 32-bit). AGP 4x - the same 32-bit channel at 66 MHz, but with effective frequency quadrupled to 266 MHz, maximum bandwidth exceeding 1 GB/s. AGP 8x - additional modifications allowed to achieve 2.1 GB/s bandwidth. AGP graphics cards and corresponding motherboard slots are compatible within certain limits. Graphics cards designed for 1.5 V do not work in 3.3 V slots and vice versa. But there are universal connectors that support both types. Some new graphics cards of the last AGP series, such as NVIDIA GeForce 6 and ATI X800, have special keys that do not allow to install them into older motherboards, which do not support 1.5 V voltage. The last AGP cards supporting 3.3 V are NVIDIA GeForce FX 5x00 and some ATI RADEON 9x00 cards except for R360-based models. But if a new graphics card has the AGP 2.0 connector, it won't work in the old system. AGP 3.0 graphics cards have the same connector as shown above, and they can be installed into AGP 2.0 motherboards. Besides, there are AGP 3.0 graphics cards with the universal connector, which can be also installed into AGP 1.0 motherboards. As you can see, theoretical difference in bandwidth is two times, but actual test results demonstrate that AGP 8x has no significant advantage over AGP 4x. 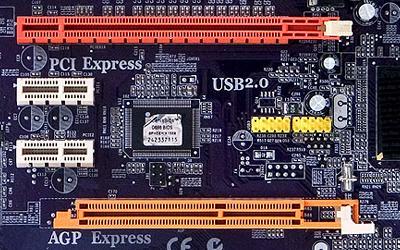 Note that the transition from AGP to PCI Express brought about hybrid motherboards with the so-called "AGP Express" slots. These slots would often be used together with the PCI Express x16 slot, but they are not fully-fledged AGP slots and operate at the speed of usual PCI slots. They are very slow, and can be used only to wait out the transition period to fully-fledged PCI Express. Graphics cards designed for outdated AGP are actually not reviewed in our articles, so we'll limit ourselves to the text above and the link to our latest tests of AGP graphics cards. PCI Express (also "PCIe" or "PCI-E"; do not confuse with "PCI-X"), formerly known as "Arapaho" or "3GIO", differs from PCI and AGP being a serial interface (not parallel), which allows to reduce the pinout and increase bandwidth. PCIe is only one example of transition from parallel buses to serial. Other examples are HyperTransport, Serial ATA, USB, and FireWire. PCI Express has an important advantage - it allows to add several lanes into a single channel to increase bandwidth. Multi-channel serial design increases flexibility, the system can allocte fewer lanes with few pins to slow devices, faster devices can get more lanes. The PCIe interface transfers data at 250 MB/s per lane, which is almost twice as fast as usual PCI. The maximum number of lanes supported by PCI Express slots is 32, which gives us 8 GB/s of bandwidth in each direction. And the PCIe slot with eight working lanes is similar to the fastest AGP version. It's all the more impressive considering that data can be transferred both ways simultaneously at high speed. The most popular PCI Express x1 slot gives us 250 MB/s per lane in each direction. And PCI Express x16 (16 lanes), which is used for graphics cards, provides up to 4 GB/s in each direction, respectively. Even though a connection between two PCIe devices is sometimes assembled from several lanes, all devices support at least a single lane, but they can optionally work with more. Physically, PCIe expansion cards work well in any slots with the same number of lanes or more. For example, a PCI Express x1 card will work well in x4 and x16 slots. A physically larger slot can work with logically fewer lanes (for example, a usually looking x16 connector may have only 8 lanes). In any case, PCIe will choose the maximum mode possible and will work fine. Graphics cards usually use x16 connectors, but there are cards with x1 connectors as well. And most motherboards with two PCI Express x16 slots operate in x8 mode to form SLI and CrossFire. Other physical slot modifications, such as x4, are not used for graphics cards. All of this concerns only the physical level. There are motherboards with physical PCI-E x16 slots, which actually have only 8, 4, or even 1 lane. Any graphics cards designed for 16 lanes will work in these slots slower. By the way, photos above show x16, x4 and x1 slots to compare with a PCI slot (below). The comparison we are interested in is in the end of the article, pay attention to the last two tables. As you can see, the difference is not big with medium settings, but it grows in heavy-load modes. A big difference is registered in case of a less powerful graphics card. Just take it into account. PCI Express differs not only in bandwidth, but also in new power consumption features. This necessity arose because AGP 8x (Version 3.0) could transfer no more than 40W. It was insufficient for the latest AGP graphics cards, which were equipped with one or two standard 4-pin power connectors (NVIDIA GeForce 6800 Ultra). PCI Express can transfer up to 75 W, and additional 75 W can be obtained via the standard 6-pin power connector (see the last part of this section). Recently they have started releasing graphics cards with two such connectors to provide up to 225 W in total. Later on, PCI-SIG presented main specifications of PCI Express 2.0. The second version of PCIe doubles the standard bandwidth from 2.5 Gbps to 5 Gbps, so the x16 connector allows to transfer data at up to 8 GB/s in each direction. PCIe 2.0 is compatible with PCIe 1.1, old expansion cards will work well in new motherboards, which are expected in 2007. The PCIe 2.0 specifications support 2.5 Gbps as well as 5 Gbps transfer rates. This is done to provide backward compatibility with existing PCIe 1.0 and 1.1 solutions. Backward compatibility of PCI Express 2.0 allows to use old solutions with 2.5 Gbps in 5.0 Gbps slots, which will just work slower. A device designed according to Specifications 2.0 can support 2.5 Gbps and/or 5 Gbps throughputs. While the key innovation in PCI Express 2.0 is its transfer rate doubled to 5 Gbps, that's not the only change. There are other innovations to increase flexibility, new software tools for connection performance management, etc. We are more interested in changes that have to do with power supply, as power requirements of graphics cards are constantly growing. The PCI-SIG group have developed new specifications to cater for the growing poweer consumption of graphics cards. The specs enhance the current power supply capacity to 225/300 W per graphics card. A new 2x4-pin power connector is used to support these specs. It's designed to power future graphics cards. Graphics cards and motherboards supporting PCI Express 2.0 were announced and appeared in stores in 2007. Both main GPU manufacturers, AMD and NVIDIA, launched new series of GPUs and graphics cards in Autumn/Winter. They support the increased bandwidth of PCI Express 2.0 and use the new power supply features. They are all backward compatible with PCI Express 1.x motherboards, of course. PCI-SIG, responsible for official standardization of PCI Express solutions, accepted the PCI Express External Cabling 1.0 specifications in 2007, which describe the data transfer standard via the external PCI Express 1.1 interface. This version allows to transfer data at 2.5 Gbps, the next version to increase the bandwidth to 5 Gbps. 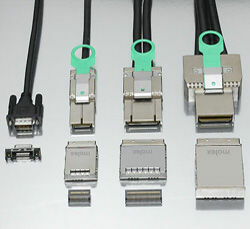 The standard specifies four external connectors: PCI Express x1, x4, x8, and x16. Senior connectors are equipped with a special key to make it easier to plug them. The PCI Express external interface can be used not only for an external graphics card, but also for external storage devices and other expansion devices. The maximum recommended cable length is 10 meters, but it can be increased by connecting cables through a repeater. Why is that useful for graphics cards? For example, it can make things easier for notebook users - a low-power integrated graphics core will be used in battery mode, but when connected to an external monitor, the system will use a powerful external graphics card. These cards will be much easier to upgrade, since you won't have to open up your PC. Vendors will be able to design new cooling systems, which will not be limited by expansion card peculiarities. There will be fewer problems with power supply - graphics cards will most likely use external PSUs built into the same external enclosure with a graphics card to share the cooling system. It will be easier to build SLI/CrossFire configurations. So, considering the growing popularity of mobile devices, such external PCI Express solutions shall become quite popular. The article does not touch upon old interfaces, which affected performance in old times. But then vendors switched to producing AGP graphics cards, but its first specifications were insufficient. AGP 1.0 could even limit performance in some cases. So the standard was modified later on. Versions 2.0 (AGP 4x) and 3.0 (AGP 8x) achieved high bandwidth, and the performance did not exceed those values. The absolute majority of modern graphics cards are designed for PCI Express. So we'll analyze only this slot, all AGP details are provided for your information only. Although graphics card vendors still produce AGP Mid-End cards (ATI RADEON X1950 PRO, NVIDIA GeForce 7800 GS and 7600 GT), they all use a special bridge to translate PCI Express calls into AGP. There are no new AGP graphics processors. So, new graphics cards use the PCI Express x16 interface with the performance of 16 PCI Express lanes. It gives us up to 4 GB/s in each direction (up to 8 GB/s in case of PCI-E 2.0) - approximately two-four times as much as AGP 8x. It's important to note that PCI Express works in both directions at this speed, so PCI Express may have an advantage over AGP in some cases. But AGP 8x bandwidth is most often sufficient, and there is nearly no difference between those cards and similar PCI Express solutions. Both AGP and PCI Express versions of same graphics cards perform similarly. For example, RADEON 9600 XT AGP and RADEON X600 XT PCI Express. But AGP has no future. You should think about it, only when you need to upgrade it. All new motherboards support only PCI Express. The fastest graphics cards are not manufactured with AGP interface, and those that still exist are hard to come by. If you are to buy a new graphics card or a motherboard plus a graphics card, you should really go for PCI Express solutions. This interface will be wide-spread for several years to come, and its new version will be compatible with the existing.